Director Ed Wood’s utterly preposterous 1959 masterpiece of poorly executed film-making -- PLAN 9 FROM OUTER SPACE -- is slated for a national theatrical reissue, in color for the first time. The film, part of THE ED WOOD FILM FESTIVAL includes other Ed Wood oddities including home movies and commercials directed by Wood. San Diego, California-based Legend Films, Inc. has completed the most extensive restoration of PLAN 9 to date, including colorization of the film utilizing new, proprietary digital technology. 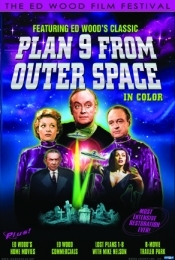 In addition to PLAN 9 FROM OUTER SPACE, the theatrical release also includes never-before-seen Ed Wood home movies (yes, see Ed model his famous angora sweater and fishnet stockings), rare Ed Wood commercials, the LOST PLANS 1-8, narrated by Mystery Science Theater 3000’s Mike Nelson, and much more. Los Angeles-based Holland Releasing will distribute the program theatrically.